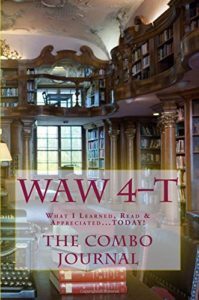 WAW 4–T: The Combo Journal—What I Learned, Read & Appreciated…TODAY! Are you wondering why I named it WAW? It kind of sounds like a bird call right? “Waw, waw!” I admit that if you hear the title or see the cover for the first time, the concept is not automatic; however, when you look at the original title page below or preview the book on Amazon.com here, it’s rather self-explanatory. Since WAW is a combo of the first three books in the series – the titles of which are all acronyms—it naturally followed that the Combo’s title would be some combination of them. Therefore, WAW gets it name from the first letter of the preceding journals (i.e., the 1st “W” stands for WIL–T™, the “A” represents the AWIR–T™ journal, and the last “W” refers to the gratitude journal, WIG 4–T™). Mystery solved! I still like the bird call perspective though…come to think of it there are birds on the cover (they were on the original cover, the image above is of the latest cover)! M-m-m.
Why create a Combo journal? 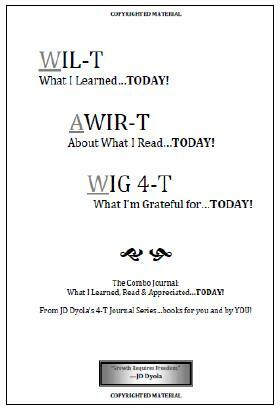 Now you may ask: “JD, what’s the point of making a combo journal from the other three books in the series?” Good question! You know, Dale Carnegie once said, “We are all dreaming of some magical rose garden over the horizon instead of enjoying the roses that are blooming outside our windows today.” As I explained in WAW‘s introduction, “Sometimes we all just want to simplify our lives, lessen the number of items in our bags, and enjoy those figurative roses.” So, this journal provides a single tool for each day. 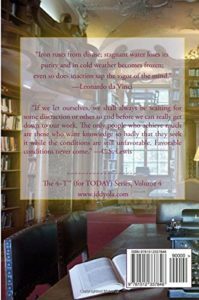 You have micro-sections for what you’ve learned, read, and appreciated during the day, adjacent spaces for general notes about the current day, and reminders for the next. In addition, for many people a single book is easier to carry and use than 3 separate ones, for others the individual journals are more functional. Everyone is different! I say get all four. Yeah, that’s the ticket! Buy the entire series ☺.